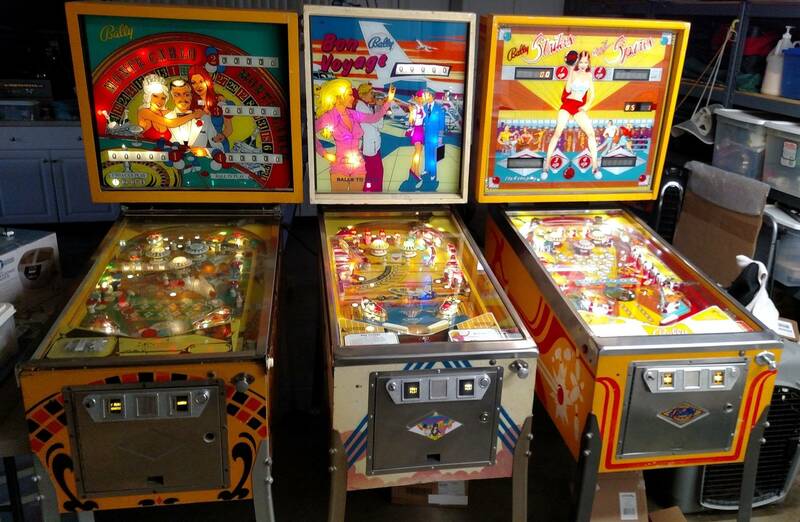 » Forum » All Pinball » Thoughts on pins in CA Garage? » Thoughts on pins in CA Garage? 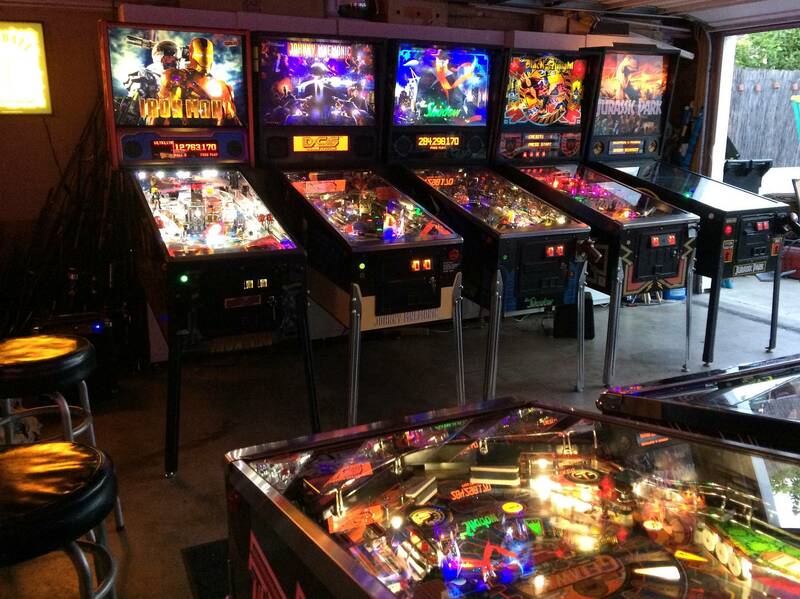 Thoughts on pins in CA Garage? 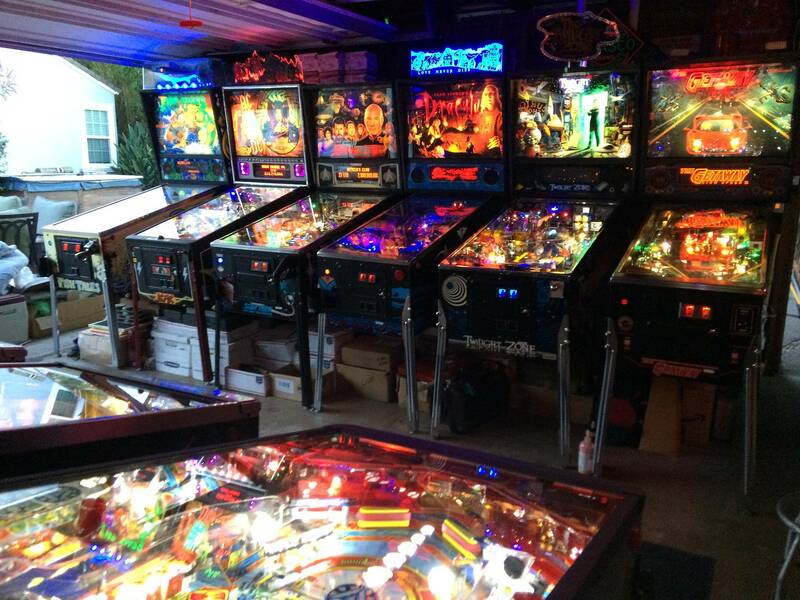 I've run out of room in my gameroom and I'm considering putting a pin in my attached garage. It's not humid here in CA and the outside temps range from the rare 20's up to 110 here during the year. So what are your opinions on keeping pins in garages? I've got 2 furnaces, a water heater, and a full sized fridge/freezer in there. There are standard air vents to the outside currently. Being attached, I doubt it gets below freezing and probably temp doesn't change too wildly? Those are the only things that would concern me. Otherwise should be fine. I've wonder if it does have impact on the hardware considering how hot the garage naturally gets during operational times. I will tell you that trying to play a pin inside the garage during the heated summers is not ideal, but I still sweat it out to play. So, if you can add a portable A/C unit that will help. I have a big portable 14,000 BTU A/C unit that should exhaust out a window. Considering I do not have a window, I just want the temporary "cooling" effect I get from the A/C unit. Maybe consider adding a window to put a Window A/C unit?? You're in a low valley. The valleys get hot as hell , making the summer temperature swings a concern. Without measuring it, I'd be a bit concerned. I personally wouldn't do it. How is the humidity? I notice a lot of stuff with a coat of rust in my garage from the humidity but I'm in Wisconsin. I'd never put a pin in my garage because of the humidity. My patio door doesn't even shut properly all summer because of the humidity, the wood swells up. My pins are always fine though inside, I crank the A/C all summer and the humidity stays in check. I would have a de-humidifier in the garage if I were you. Most of my pins are in the garage and it’s fine for the most part. Sometimes it’s a little too hot or cold to enjoy them, but that’s nothing a mini split wouldn’t fix... if I’d just buy one instead of another pin. I live in So. Cal and have had games in my garage for almost 15 years....NEVER had a problem with heat, humidity or cold. I don’t really have room in my house...at least that’s what the wife wants me to believe. 3 in the SoCal garage for a few years, no problems. Seen enough older games in sorry shape to know it would be wise to get a dehumidifier at a minimum. If your storing chlorine or acid in your garage, make sure you encase it and seal it tight. A few in NorCal garage for a number of years, no problems as well!! Is your garage insulated? If not, maybe look at heating/cooling to keep it within a reasonable range. I finished the garage and added an AC unit. Stays between 40-80 degrees year round. I’m not sure if it was necessary, but I didn’t know enough about tolerances to feel comfortable leaving all the new games outside...but tons of machines sat in freezing pole buildings for decades and they seem ok, so who knows. you'll be fine, I got 2 in my garage that's been there for 2 yrs in st louis mo. where it goes from 0 to 100 degrees. I just don't turn them on when its below 40 or so. I appreciate all of the input guys. Thank you. Those of you with pins in your garage, did you seal off your vents to the outside? I would do installation , dry wall would keep room a lot cooler and a solor fan in the roof ! I haven't, the vents close to the foundation have not been touched. pins got rotated in. Was surprised how well the EM's survived with all there relays and switches!! I left the two small vents near the floor as they were. I always heard they were there for safety reasons, such as for venting car exhaust and also possible buildup of gasoline vapors, which are heavier than air and can sink to the bottom and form a potentially explosive layer near the floor. The water heater is in the garage and the code is to have it installed up on a box, that’s so the flame would be higher up than those fumes if they happen to be there. We don’t get much humidity in SoCal, and the temps are pretty mild. We freeze to death when it hits low 60s. 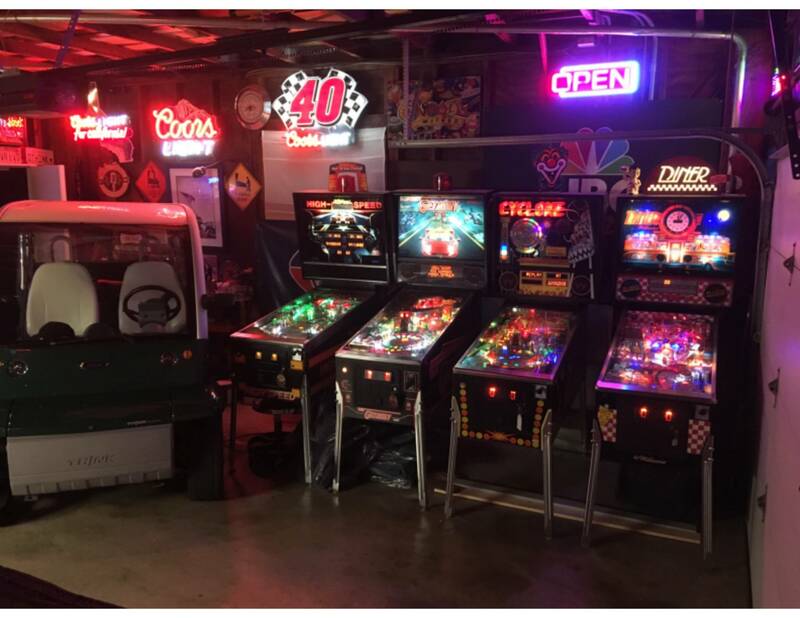 I had 4 fully restored games in my garage for 2 years. Didn't do anything special to the garage and games are still in perfect condition with no signs of rust or anything. My concern would be that they’d become sentient and steal one of your cars. 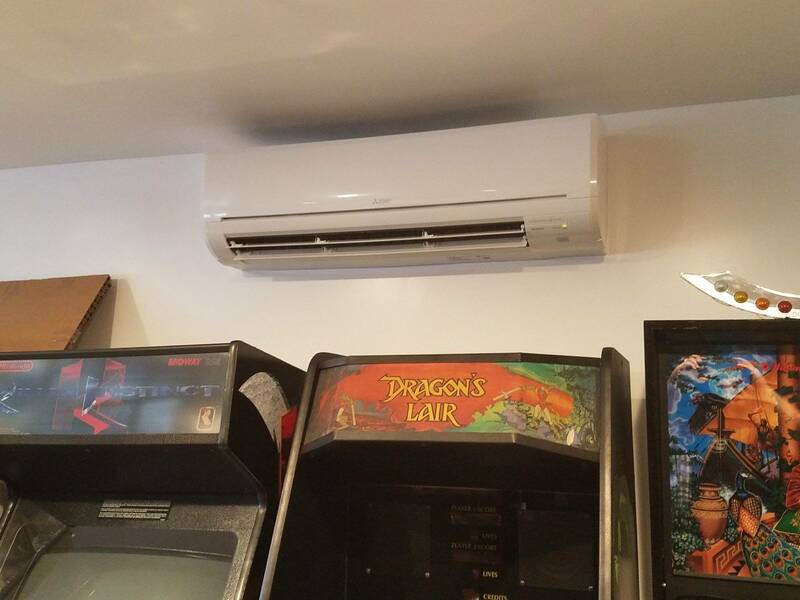 I got sick of hot summers, space heaters in the winter and constantly emptying my dehumidifier so I had this ductless unit installed in my garage. With installation it cost me about what I paid for a new JJP pin. Cools, heats and dehumidifies. Loving it. Pretty cool. Make and model? Mitsubishi MSZ-24NA. Split system heatpump. Being in CA you may be able to get away with a cheaper model with a little less power, depending on your space. It gets pretty cold here in WA during the winter. I think it all depends on the machine. The newer sterns have metal backboxes that stand up to weather climate. If you have an older Data East or Sega, those backboxes are made real cheap and will thrash and warp quickly do to the press board consistency in the colder setting.